to wish you all the happiest of Valentines' Day! G'eve, Candy ~ WOW! These table scapes are all so inviting. I only wish mine were nearly as pretty. Wow! What an amazing collection of tablescapes! I don't think I could pick a favorite because they are all so pretty...but I do adore the red and white table with the ribbon weaved through the plates...just gorgeous! Ohhh my goodness! My dear friend, I can always count on you to provide the prettiest tables ever!!! Such Valentine's sweetness!!! Each table is fabulous in it's own right...that's for sure! 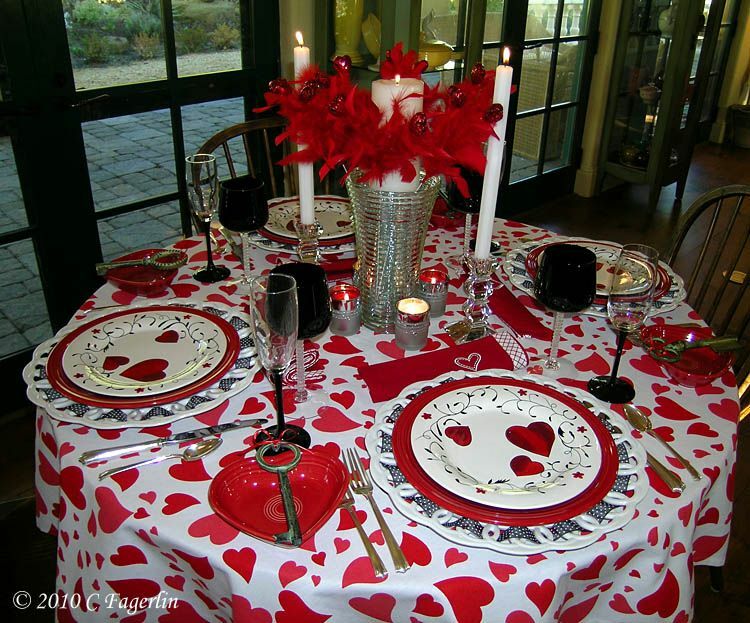 I really enjoyed looking at all of your different table linens...what an awesome collection that you have for Valentine's Day! 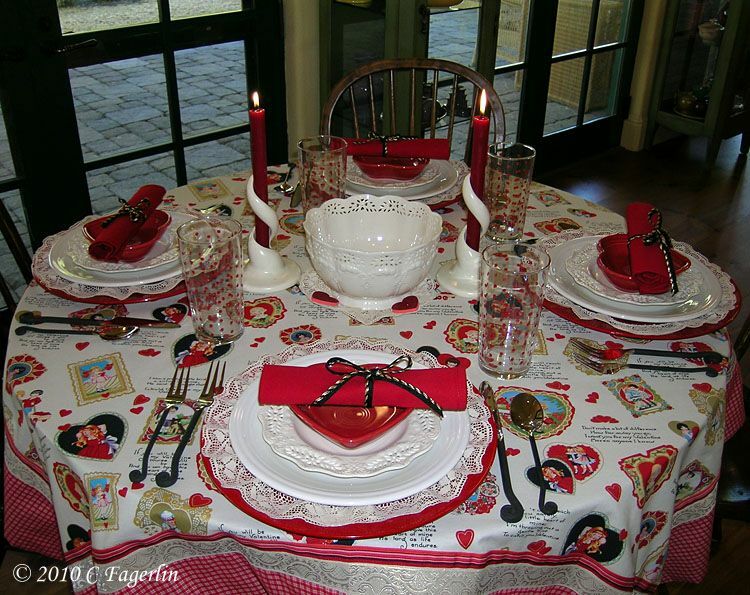 I think my favorite tablecloth is the one with the darling vintage valentines on it...it has the pretty red checked trim around the bottom of it! 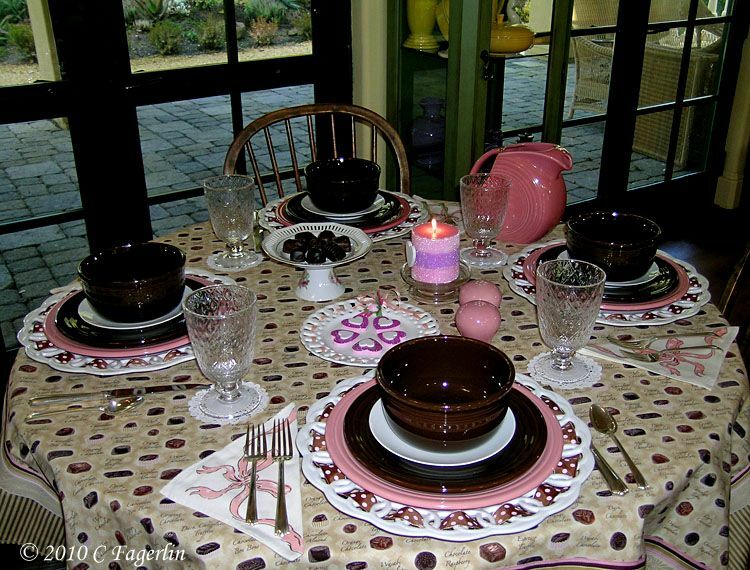 I really like the brown and pink tables...love that they were a bit different from what we think of as the "traditional" Valentine's! However, that last table...all done in red, black, and white...is the most elegant...it's gorgeous!!! Love your beautiful table centerpiece on that one! Where did you find all the pretty white plates that have the different ribbons laced around the edges? Those are soooo pretty!!! Well dear lady...you have certainly outdone yourself this week...providing us with some of the most beautiful Valentine's tables that I've seen!!! Thank you so much for sharing them with us for Sunday Favorites today!!! This has been such a treat! Have a wonderful Valentine's Day, my dear! All of your table settings are gorgeous. You really know how to set them up. Good morning on this Valentines' Day and thanks for stopping by to check out this weeks virtual Valentine gifts to you and all my readers! The cutwork plates came from Home Goods, but I've seen them other places too. Do a Google search and you'll most likely come up with many choices. Ooooo La La for the plates with the ribbon pulled through their slotted edges. AND that red plate in the center of the table with the white bow print is so stinkin' cute! We have fiesta ware around here too - - - but you have a much LARGER selection of pieces/colors than we do, though we have a set of 16 dinner plates in various colors. Ours are the "new" variety and not the antiques. Oh wow I lost count I loved them all but I think my fav. was the light pink and the chocolate table cloth. Yum. BTW I loved the silver post just below. I love mexican silver n pottery n textiles n wire n I guess I love Mexican artistry. LOL. 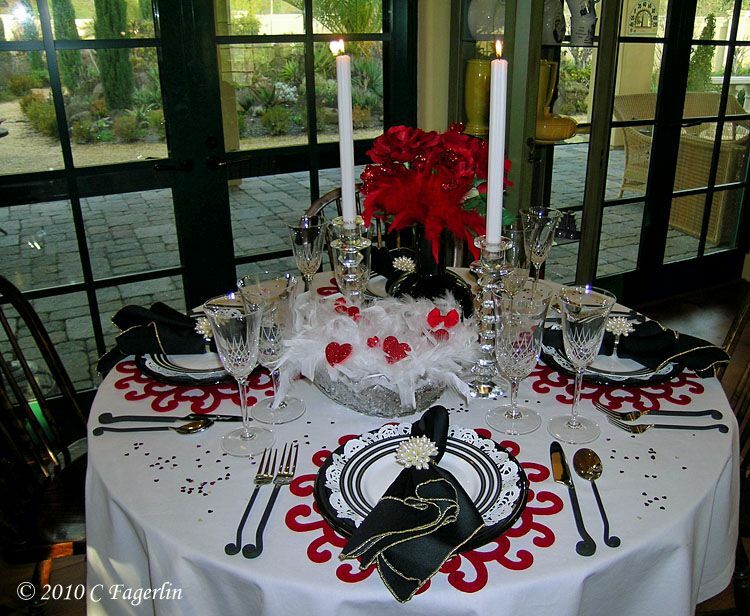 All of your Valentine's tablescapes are beautiful! 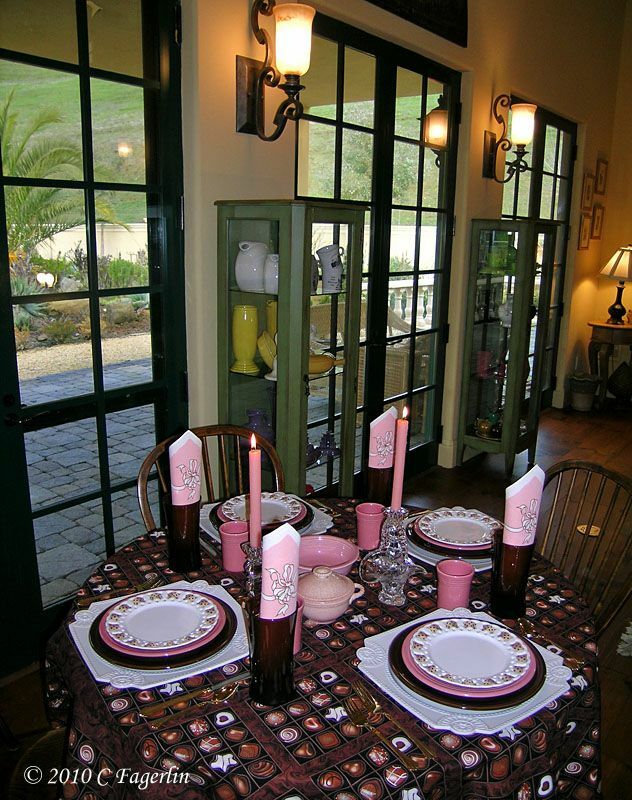 And I love all of your gorgeous french doors leading out to your patio! happy to be here...wow...i love all the glorious light pouring into you space! 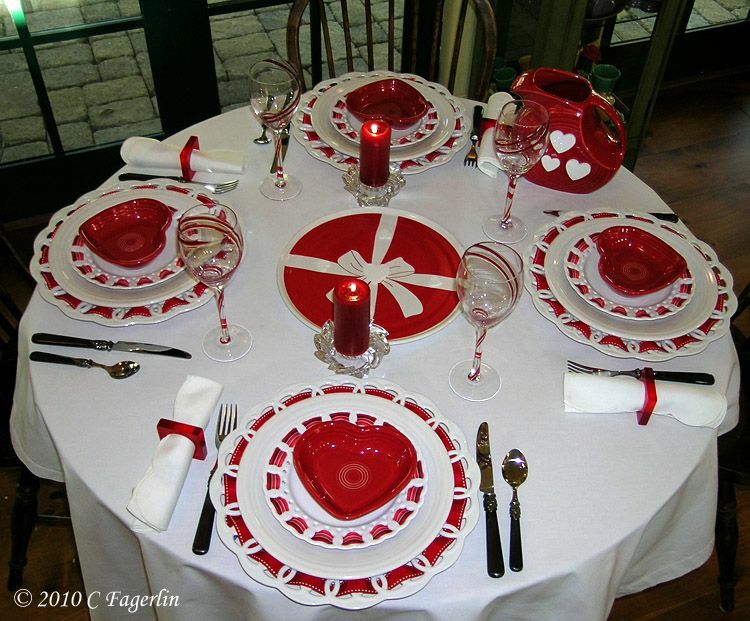 Thanks for all your nice comments on my Valentine tablescapes! They were a lot of fun to put together. Now I'm ready for Spring! See you on Sunday for another "Sunday Favorites."